This home with beautiful community pool & spa is located inside the gated award-winning Augusta Ranch Golf Community. Families!!! You can walk outside our doorway and within 45 seconds you are swimming or hot-tubbing. Pathway to the pool and spa is just 3 houses down! Take a 90 second ride or 10 minute walk down a quiet street to a perfect park. Huge jungle Gyms, basketball court, baseball diamonds, beach volleyball, soccer pitch, and large field with paths for bike riding, skateboarding, etc. Our home is very kid friendly! We have bunk beds, a playroom with toys, games & kids books, Playstation 2 (with games), and movies for all ages. We have most things for babies/toddlers that are hard to bring on the plane: playpen/crib, high chair, infant swing, diaper genie, bottle warmer, baby monitor, stroller, wagon, 4 bikes, small bike (with trainning wheels), another bike for 6 to 12 year old, small plastic mattress(for possible bed wetters)everything you'll need for the kids from infants to toddlers to pre-teens. No need to travel with anything. We have added 2 adult bikes and a basketball net. Area attractions include Sunsplash Water Park, Phoenix Zoo, MLB spring training, NASCAR, PGA & LPGA events, Barrett-Jackson car auction, the list goes on. Just minutes to great shopping and formal or casual dining. Open floor plan, large outdoor patio, double garage. We have owned this home since May of 2008. Even though it's been 10 years, we still try to get better. We ask that if there is a problem, no matter how small, that our guests contact us so we may have the opportunity to rectify it. We truly want your stay to be great!! PLEASE EMAIL YOUR REQUESTED DATES PRIOR TO BOOKING TO VERIFY AVAILABILITY. Our family loves to escape the long cold Alberta winters. Even the dog hates going home after 3 weeks of high 60s in Dec/Jan. Nice to know how cold it is back home while golfing. Phoenix is just 2 hour and 40 minutes from Calgary on a direct flight. Florida was just to far to travel with small girls. Lots of golf, no bugs, or the turbulent weather of South Florida. Half bathroom on main floor. We have wireless WiFi. The code to the network is on the inside of the pantry door. Please have a look in the pantry there may be items you will not need to buy. PSII with many games and controllers. We have 4 bikes for ages 5 to 10 and a smaller bike with training wheels age 3 to 5. Also 2 adult bikes to take the whole family for a tour around the neighbourhood. Many very close by. With many within a 20 minute drive. Very comfortable for a family with small children! The house was clean, comfortable, and easy to find. There was a small problem with cleaning when we first arrived but Chris responded quickly and within an hour the problem was solved! This house was perfect for traveling with a toddler...plenty of toys, movies, and even a pack n play! The garage had other baby items such as stroller, wagon, high chair, and even a car seat though we did not need to use them as we had brought our own. I also appreciated the kitchen had plastic plates and toddler cups as well! The pool was only a short walk away though it was cold in March! We enjoyed our stay and plan on staying again next year! Thanks for taking time out of your busy day to let us know our hard work is working. Please stay with us again! Enjoyed our stay very much. Secure, safe community that we could safely take walks. Two bar/restaurants within walking distance. Hot tub was great. Owner extremely friendly and very responsive. Location is just off Hwy 60 so easy access to anywhere. Would stay here again. The property is set up for a kids and families. Quiet neighborhood, but close enough to interstate to remove some travel stress. Essentials (grocery store, starbucks, pizza place) are nearby, but not much else around. Our home's walkability score is excellent. Up to 60 stores within a 6 minute walk. We needed a home to accommodate us, our 2 daughters and their families. This house was it. 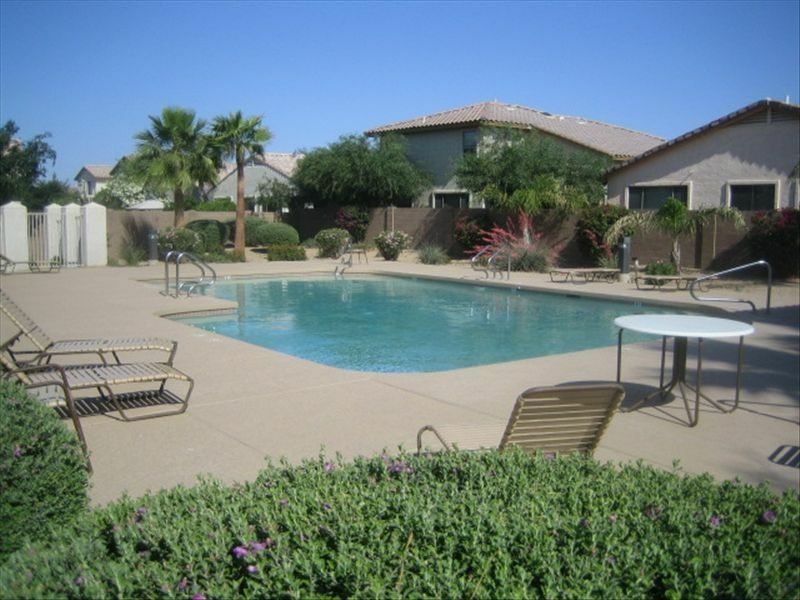 It was in the location we desired and had all the amenities we were looking for - quiet gated community, Walking distance to grocery, pubs, and restaurants. Activities for children ranging from 2 to 15 both in the home and the community were a plus! The golf was enjoyable and reasonable. The community pool and spa were great, although the pool was not heated. Nice back yard with putting green, BBQ, and covered patio. A good home for families with children. The owner was easy to contact and responded immediately to my questions. Thanks Chris! The home was a perfect place for a family reunion with kids and grandchildren, wished there had been propane as we were not able to use the grill. It is in pretty tough shape. We are sorry you were inconvenienced, we know outdoor cooking is part of the enjoyment of staying in Arizona. While we do our best to anticipate all our guests’ needs, we were simply unaware it had been emptied by the previous guest, and apologize for the oversight. In a decade of hosting, this is the first time this has happened. Being a good host above all else means making yourself accessible, on the occasion something unforeseen happens. It is why we make ourselves available to contact any time, for any reason. There is a propane exchange just around the corner, a quick call or text and we could have taken care of it promptly for you. We had used the BBQ ourselves in late January, and feedback from other guests confirm it is in good working order. We will strive to ensure this does not happen in future, and continue to remind all our guests that we are only a phone call away if anything unexpected happens. We were very confused by this review? The golf community of Augusta Ranch was built in 2001, that’s no secret, we put a picture in our listing in case anyone is interested in researching the neighbourhood. HOAs in the area are extremely strict, we couldn’t let it run down even if we wanted to! In the past couple of years, we have installed new flooring, fresh exterior paint, new window coverings, replaced Hot Water tank and AC compressor. There are 3 new stainless steel appliances and hardware throughout the house. This past January we upgraded the backyard with brand new turf and a putting green for our guests (an authentic desert cactus is on its way this spring!). We are having difficulty understanding the “old run down” comments? We painted the entire interior just 8 years ago, and this past winter made plans to do again in spring 2018 as we are starting to notice the wear and tear on the baseboards (no surprise when you rent to as many families as we do). That is the only thing we can think of? As for “not clean”, that also surprised us very much, as we have been with the same cleaning service for several years with no issue, and were totally unaware you had experienced a problem? The only thing we could think of, is that we sometimes do have a “tight turnaround” in between guests this time of year, and perhaps the regular Hotel Clean was not done to it’s usual standard? As with ANY unexpected problem, we implore our guests to contact us so we may rectify the issue asap. If the cleanliness was not to your standards, we apologize, and ask for your help in providing details so we may take it up with our Cleaning Service. Whether they did not have enough time, or were employing new staff, whatever the issue we will get to the bottom of it. We take pride in our home and strive to make our guests happy and comfortable. In this case, we can only refer to our record and previous positive reviews, and reiterate that we are available to our guests at any time and value all feedback. If we learn anything whatsoever is wrong, we make it our priority to resolve it and ensure our guests are pleased. For a guest to say nothing during their stay, offer 4 stars and then leave a disparaging review is more than a little unfair.